Universities provide bars, yoga classes and gyms on their campuses, so why not places where students of every religion can go to pray? asks Molly Quell. Last week, Delta, the Delft University of Technology magazine, reported that the university was investigating how to provide silent rooms on campus. The same week, the AD reported that students in The Hague had requested a prayer room. Judging from the reaction in the media, you could have mistakenly thought Muslim students at these schools had demanded the forced conversions of the princesses. The AD had something to say. Omroep West reported on it. PowNed had a story. Geen Stijl voiced their thoughts. Even the JOVD (the youth wing of the VVD) had something to say. So I fully expect to see the JOVD calling for the closure of TU Delft’s nine faculty pubs and protesting outside the pottery class offered by the Culture Centre. It’s not the first time this conflict has arisen. 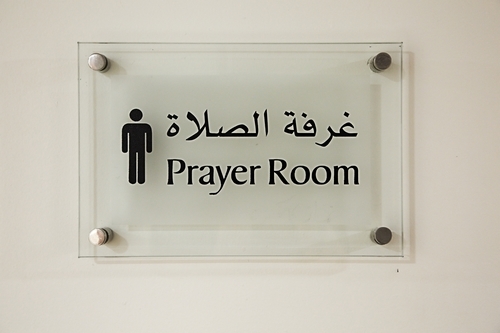 In 2012, Nos reported that students at The Hague’s hbo college had requested prayer rooms. At the time, it was pointed out that universities in Leiden, Rotterdam, Amsterdam and Maastricht all offered prayer or meditation rooms for their students. These universities certainly have no problems accepting tuition money from international students, but when asked to fulfil those students needs, suddenly campus is only for academics. The reality is universities play a much larger role in the lives of their students and staff than merely a place to study and work, something that is clearly visible in the amenities offered by modern institutions: bars, cafes, sports facilities, concerts, festivals, yoga classes, debates and movie showings. It seems to me that if the university can indulge my need for an afternoon beer, they can accommodate a group of students who would like a quiet space to pray. And if you want to argue that the university is no place for religion, then you’d better also be arguing in favour of classes on Whit Monday. Otherwise someone might mistake you for a bigot. Molly Quell is the international editor of Delta and a journalist based in Delft. The opinions expressed here are entirely her own. You can find her on Twitter at @mollyquell.